Northland Blueberry is the hardiest of the half-high highbush blueberries. It's also the best looking. In fact, it is frequently planted as an ornamental. Northland Blueberry produces large quantities of medium-size berries that taste amazing but are on the softer side, which matters to some people. 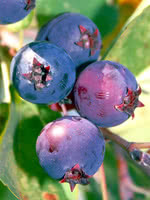 You must pair Northland Blueberry with another suitable blueberry variety because it is not self-pollinating. You must also prune Northland Blueberry to maintain its health and productivity.